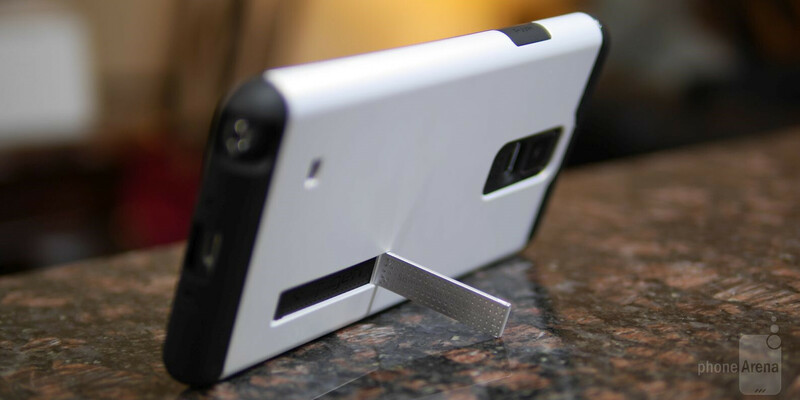 The Spigen Tough Armor case might be the sturdiest one that the company makes for the Samsung Galaxy Note 4, but for those who prefer something just a smidgen more snug, the Spigen Slim Armor case might be the next best solution for you. Indeed, it’s not quite as hefty as the aforementioned case, but the Slim Armor still manages to provide nearly the same level of protection. Visually, there’s a resemblance to the Tough Armor case, but unlike that one, the Slim Armor Case for the Note 4 is more rounded around the sides – making it more comfortable to hold, as opposed to the sharper feel of the Tough Armor case. Employing the same double layered design of the series, it’s comprised out of a TPU inner case and a polycarbonate outer shell that mainly provides integrity to the case. Of course, the TPU material helps to absorb and disperse shocks – so it’s still able to safeguard the phone from drops as high as 4 feet in our experience. Overall, the design is a little bit more favorable to the eye, more so when it’s available in a total of 6 different colors. On top of that, there’s also a kickstand on the back to prop up the phone in landscape. It’s certainly useful for those situations when we want to kick back and watch a video, but it’s rather flimsy – causing it to collapse when too much pressure is applied. Nonetheless, it’s a feature we appreciate. Right now, you can snag the Spigen Slim Armor case for the Samsung Galaxy Note 4 for as low as $17.99 through Amazon, which is a smidgen better than the $21+ cost of the Spigen Tough Armor Case. Between them, we prefer the curvier feel of the Slim Armor case – while at the same time, it doesn’t compromise a whole lot in terms of protection. I have this case. I added extra protection by installing a Zagg glass screen protector.